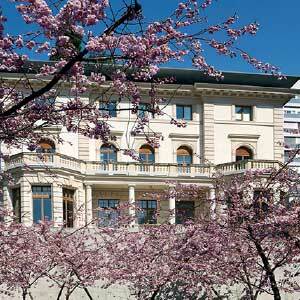 Established in Geneva, the Louis-Jeantet Foundation seeks to further the cause of medicine. It funds European biomedical research, both in its fundamental and clinical aspects. It encourages the continuation of innovative projects at all stages in a researcher’s career. A dynamic role – hence its originality. The Foundation devotes some CHF 3m per year to promoting biomedical research, an investment divided equally between European research projects and local projects in association with the Faculty of Medicine of the University of Geneva. Thanks to its remarkable contribution to biomedical science and to the level of financial support it is able to provide, the Louis-Jeantet Foundation is one of the most important European foundations in its field. The Louis-Jeantet Foundation is a member of the Association de Genève des Fondations Académiques AGFA and of the Association of Swiss Grantmaking Foundations SwissFoundation. The primary goal of the Foundation is to award annual prizes aimed at encouraging and financing the best European research projects in medicine, both clinical and fundamental, notably in the fields of oncology and cardiovascular diseases, but with a concern for any illness threatening mankind. The Foundation’s second goal is to encourage teaching and the development of research at the Faculty of Medicine of the University of Geneva, or in cooperation with it, mainly by creating and financing professorial positions and their associated infrastructure. True to the spirit of its founder, the Louis-Jeantet Foundation is driven by a vision which is both humanist and political, namely to encourage European and local biomedical research in the fight against diseases threatening humanity, but also to support the role and standing of European and local research centres vs. international competition. The Louis-Jeantet Foundation encourages excellence, and only excellence. It undertakes to respect the academic freedom and independence of researchers and to finance innovative projects that offer hope to numerous patients.